When it comes to marijuana accessories, there’s a plethora of products to choose from in almost every category imaginable. But, oddly enough, there’s one aspect of the cannabis accessory industry that has been somewhat overlooked. Tools to help make personal kief collection easier are often found in combination devices and there has been little innovation in standalone products catered toward kief collection. Sure, there are products like a kief box, kief press and other kief catcher-style devices, but not too many that help you actually collect kief once you separate it from your cannabis flower. Being fans of collecting kief ourselves (mainly via grinders), we were delighted to hear that a new product recently hit the market that makes the process easier. 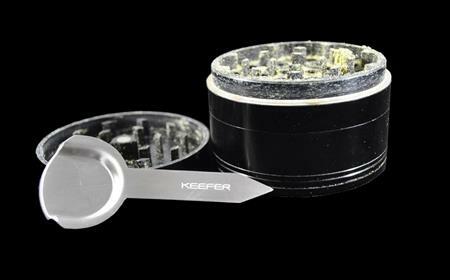 The Keefer Luxury Kief Scraper Multi-Tool Accessory is designed with a wide variety of cannabis consumers in mind and aims to help make collecting, loading and packing kief a whole lot easier. Each grinder was used on a daily basis for several weeks leading up to the review. The Space Case had a fairly large amount of kief in the collection chamber, while the SharpStone had only a moderate amount. With that being said, let’s move onto the actual review! To examine the functionality of the Keefer tool, our review team tested out several aspects of kief collection, loading and packing. To test the kief collection abilities of the Keefer tool, we scraped and collected both our Space Case and SharpStone grinders clean. Grinders are a cannabis consumer essential and you’ll find one in almost every marijuana enthusiast’s arsenal. In fact, they’re probably one of the most popular cannabis accessories – and not just for their ability to break down flower. Most grinders have the ability to collect kief over time through careful screen filtration and this is the way most consumers obtain their kief. While not every grinder has a kief compartment, the majority of the most popular grinders on the market feature some sort of kief collecting option. A lot of grinders also come with plastic kief scraping tools, but these are often flimsy and not useful when there is a large amount of kief at hand, making the Keefer a very appealing option. The PotGuide review team found the Keefer tool to be extremely effective in both scraping kief and shoveling it into either a jar for collection or on top of a bowl. When using it with the large space case, which probably had over two grams of kief ready to be collected, the Keefer made the process of emptying the compartment much easier and took significantly less time than it would with the Space Case’s standard kief pick. The scraper side of the Keefer tool is especially useful around corners and edges, allowing you to reach every nook and cranny with ease. We also found the flat edge to be helpful in collecting kief around the edges and forming larger piles. The shovel component is really quite awesome when transferring large portions of kief from one place to another, and the scraper side acts as a nice handle, too. You can also use the leading edge of the shovel side as a scraper as well to ensure you pick everything up neatly. When we tested the Keefer tool on the smaller SharpStone grinder, it still held up well and the entire review team found it to be equally effective for the most part. One thing to note is that when using the Keefer tool, a kief compartment with a deeper chamber makes things easier. The SharpStone has a rather shallow kief chamber and we had a bit of an issue with kief overflowing. However, this could easily be avoided if you scraped your kief sooner without letting it build up as long as we did. Tacking onto the functionality component, the Keefer tool is extremely easy to use and has a very ergonomic design. Most kief picks and tools are very small, making it difficult to shovel kief or scoop it easily. The shape of the Keefer tool makes it one of the easiest cannabis accessories on the market to operate and it requires little to no learning curve to use. Simply grip the shovel side to use the scraper side of the tool and flip it around to use the shovel tool while holding the scraper end like a handle. 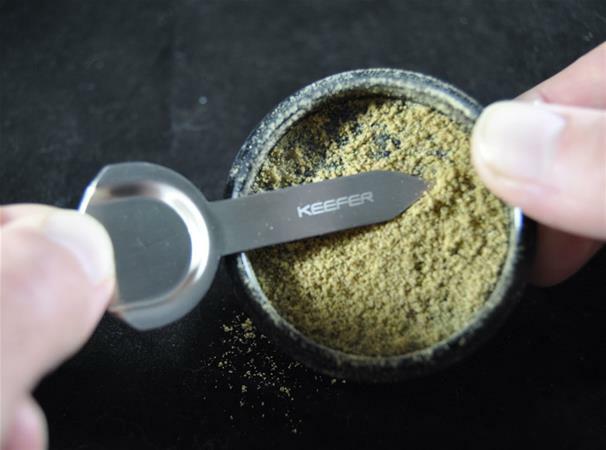 Seriously, this thing is a breeze to handle and, if you’ve ever spent hours meticulously collecting kief, you’re going to need a Keefer tool in your collection. For all of our on-the-go consumers out there, it’s important to note that the scraper end of the Keefer tool is a little sharp so if you’re carrying it in your pocket just be aware not to fall on it. Other than that, our review team found really no issue in using the product. 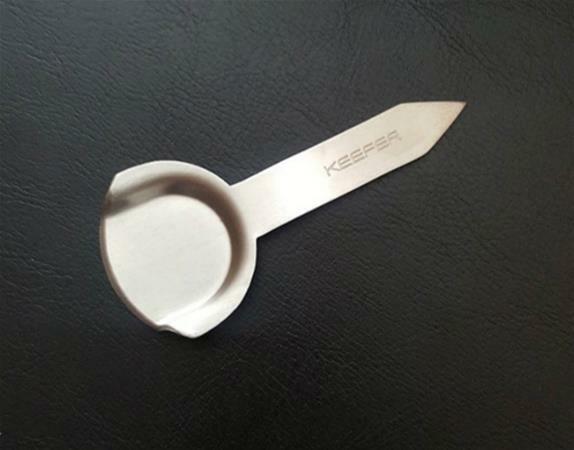 The Keefer Luxury Kief Scraper Multi-Tool Accessory has an appealing design fresh out of the package. While nothing fancy, its sleek, simple design forged out of stainless steel is eye-appealing and cleanly crafted. It also looks slightly similar to a golf divot tool as well so it’s a great product for anyone looking to keep their cannabis consumption discreet and on the down-low. On one side of the product is a pointed kief scraper while the opposite end boasts a kief shovel – each designed to be ergonomic when in use. Our review team all gave the Keefer tool high marks for its design and noted that it could be easily transported around to accompany a cannabis consumer virtually anywhere. With an appeal for the on-the-go consumer, the Keefer would truly make a great companion for hiking or other outdoor adventures. For only $14.99, you really can’t go wrong. 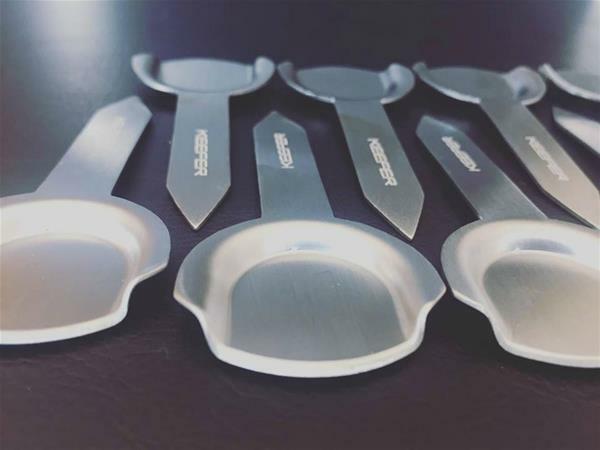 The Keefer Luxury Kief Scraper Multi-Tool Accessory is truly something that belongs in the collection of any cannabis consumer and can be useful on a daily basis. With a simple yet effective design and an easy-to-use approach to kief collection, this is the product for anyone looking to cut down time scraping and loading kief. Since we’ve gotten our hands on a Keefer tool, it has found its way into our daily smoking collection, kept right next to our grinder. The value is certainly there in the Keefer tool and for the cost there’s really no other product on the market that does what it does. This tool is something that every cannabis consumer will find useful at one point or another in their smoking careers and, even if you don’t use it every day, it is still worth picking one up in our honest opinion. Our team truly loved the Keefer tool and we thoroughly had a great experience reviewing it. 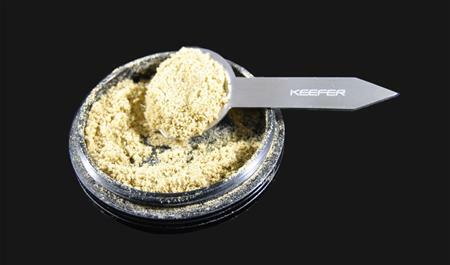 As mentioned above, there hasn’t been much innovation in the personal kief collection space so we were thrilled to get to try out the Keefer tool and put it to the test with some serious kief quantities. The Keefer tool stood up to the test and received nearly perfect marks from the whole review team. We found the simple and effective design to be extremely practical and useful in everyday cannabis consumption and firmly believe that any consumer could benefit from trying one out. So, pick one up today and say goodbye to the days of difficult kief collection! Visit Keefer’s website to purchase a Keefer Multi-Tool for yourself!